I have since found that feeling good about my work is absolutely crucial to my happiness. When I work a job that is out of line with my values, I become depressed, and when I am in dharma, following my heart, doing what I believe in and what feels right, I am filled with energy. The Buddha called this “right livelihood.” He taught that one who seeks liberation cannot hope to find freedom on the backs of others. Right livelihood is critical to the spiritual path; often when people are out of line with their values they have to numb out or shut down, not only because they are bored and uninterested but also because the pain of being outside their morals or their heart’s call is too much to bear. Interestingly, yoga brings these issues to the surface. Many times I have seen students of yoga realize that their job is hurting them. Sometimes making a change is too much to face. In these cases, people usually stop practicing yoga, and the revelation fades. The quote was a slap in the face. As if waking from a daze, I realized that I had not done postures in a month. And I saw that I had avoided yoga because it sharpened my awareness and showed me that I was unhappy. But because I had been unwilling to make a change — to move and leave the relationship — I had stopped doing the thing that increased my awareness. In this way, yoga is a catalyst that demands truth. This truth includes, but is also subtler than, simply doing what is right or wrong, ethical or moral. It means listening to your heart’s call. Aidan is correct. We do need environmental activists. But I believe that even more, we need people who are passionate about what they do, living from their heart. I don’t think one can actually serve the world best by assessing what the world needs. I think, instead, we serve the world best by responding to our heart’s call. Not our ego’s call, mind you, but our heart’s. As an environmental activist, Aidan might make a difference. That’s true. But as an architect, Aidan will be following his bliss. He’ll be fulfilled and happy. He’ll be lit up and creative. He’ll be a beacon of light and energy. And, I trust, his environmental concerns will still find a very effective, perhaps more effective, medium — maybe he’ll design green buildings or discover environmentally sustainable building materials. Notice what gives you a feeling of rightness, ignites your creativity and passion, and makes you feel most alive, and pursue that. And by the way, following your bliss does not automatically mean giving up your nine-to-five job at the insurance company to dust off your old Fender Stratocaster and get the college funk band back together. Sometimes the boring job at the insurance company is just right. Your bliss might be the paycheck that feeds your family and allows you to spend happy evenings and weekends together. Or not. Following your bliss only means tuning in to and following not your ego, not your mind, but your heart. Put another way, it means setting aside what you want and doing what God* wants for you. And God, I believe, communicates through our hearts and through a feeling of passion, vitality, and rightness. 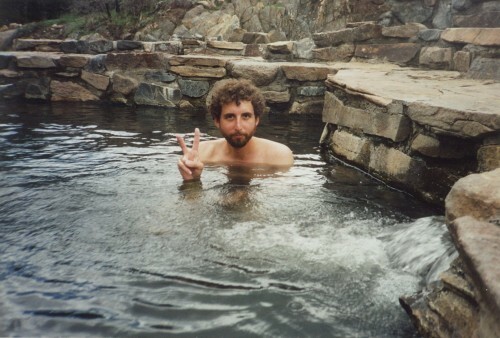 To celebrate the launch of his new book, Misadventures of a Garden State Yogi, author Brian Leaf is hosting a video contest with the theme “Insightful Yoga Comedy.” Video entries must be related to yoga, funny, insightful, and one to three minutes long. Each contest entry will be judged according to how well it meets these requirements. The Grand Prize winner will receive $250 and a signed copy of Misadventures of a Garden State Yogi. 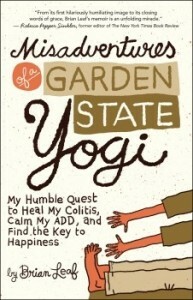 Two runner-ups will each receive $50 and a signed copy of Misadventures of a Garden State Yogi. Entries are due by 1/15/13 and must be submitted to misadventures.of.a.yogi@gmail.com. Give it a try!